As we all know, accounting can be one of the most dreaded parts of running a business. It may be difficult for you now, but when using Lizzy’s accounting module you will find it’s not so bad after all. With easy to understand reports, you can see what your profits look like in real time, whenever you need. 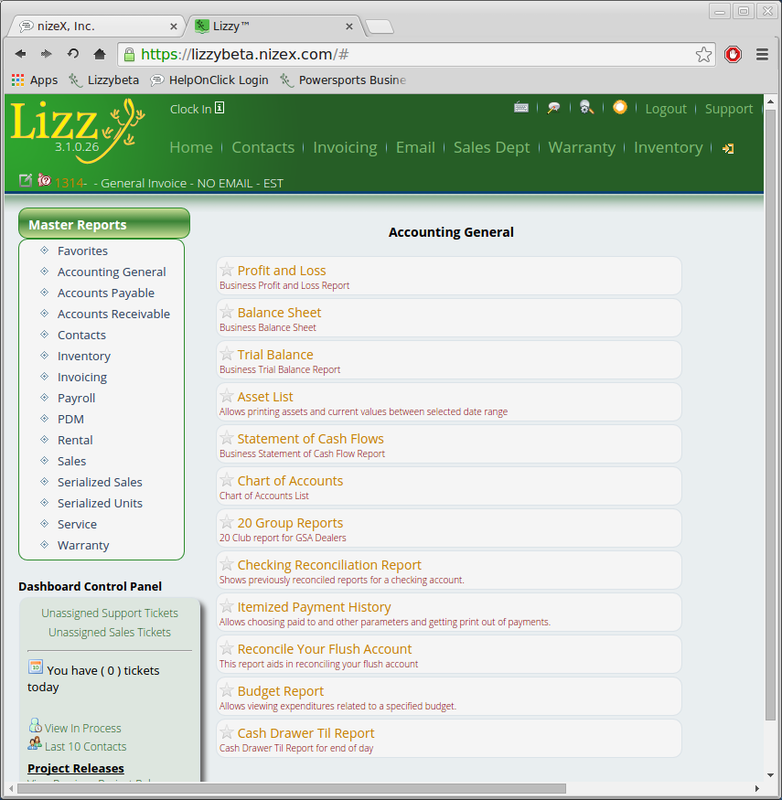 Lizzy comes with a complete accounting system. In fact, Lizzy is built around this particular module. If you choose to use Lizzy Complete, everything that goes on is managed and controlled by the accounting module- specifically the general ledger. For example, if you choose to enter a part into inventory, this can only happen if 1) Lizzy is aware of what accounts you wish to use for those adjustments and 2) what inventory method you’d like to use for keeping track of everything. So when you pay a purchase order and tell Lizzy to write a check or pay with a credit card, those payments are not only made but are linked directly to the check. It knows exactly what it was used for, in a way that allows it to undo what it did if you void it. If you make a deposit from the deposit module, it knows all of the invoice payments and Accounts Receivable payments that were used to make that deposit, and voiding the deposit will put them all back into the deposit module as if nothing happened. The level of integration between all of Lizzy’s modules is pretty impressive when you see them in action. Checking is just the beginning. Oh, and did we mention that it handles payroll and ACH transactions as well? Lizzy doesn’t just have a purchasing module. 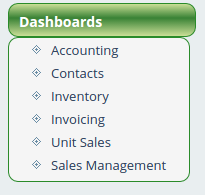 It has the ability to keep track of expenses, sublet, serialized and parts orders. Items you sell on an invoice that you don’t have or that have met their minimum value are automatically added to the purchase order and tracked all the way through shipping or hand delivering them to each and every customer. The purchase orders have the ability to electronically record themselves with vendors where supported and as with everything else in Lizzy, tightly integrate with everything around it. Paying a purchase order works with checking, credit cards, credit, debit cards or ACH. Even refinancing orders is handled by Lizzy. She can deal with back orders, shipments, special orders for customers, directly ship orders, multiple locations and even ordering items where you might order from more than one supplier. Lizzy keeps track of financed major units where you still owe the vendor and alerts you to those specific units so insure that they get paid off as quickly as possible. It integrates with Accounts Receivable to deal with Rebates, Warranty Credits, Holdbacks and anything else that you have to track. Each purchase order maintains full detail of everything that has taken place to allow for easy review and integrates all the way back to the invoice for ordering major units that you have already sold and making sure they are delivered back to the correct invoice. The purchasing module in Lizzy is the center piece for managing all of your parts and serialized inventory within the system. The Receivable module within Lizzy is as powerful as everything else and integrates with the Warranty module, Payables, Invoicing, Customer Deposits and more. Each customer record is maintained in every detail allowing for easy review of historical data as well as making sure you stay on top of customer debt and making sure the bills are paid. Warranty claims, Rebates, Holdbacks and many more types of credits are maintained automatically and once paid or you receive credit memos, will automatically become available to use in the purchasing section to pay your bills, or will show up in the integrated deposits module if you were paid with a check. Receivables also supports interest charges and tracking monthly payments and integrates into the same payment form processes you’d use everyday in the Invoicing module, keeping the learning curve small and eliminating mistakes.